Cortina d’Ampezzo or simply Cortina, as most Italians call it, is one of those places you just hear about. They talk about it with hints of a luxurious mystic that for years now has left me intrigued. Keep in mind, my intrigue was kind of those baseless ones, I had no idea where exactly it Cortina lied, or what made it special. Like nothing. Then a little over a month ago, I put it “out in the universe” that I wanted to go on vacation with my husband for his birthday, and I hoped someone would sponsor said vacation because we are trying to be financially responsible adults (and buy and furnish our apartment). The universe answered a few days later with the opportunity to stay at Hotel Ambra Cortina. Yeah Universe! We had an absolutely great time. I loved it so much that I wanted to write a post about all the interesting things one can do/eat/see while in Cortina d’Ampezzo, in addition to the post about Hotel Ambra. First things first, where in the world is Cortina d’Ampezzo? It’s a small town in the Veneto region of Italy. That’s the northeast side. Cortina is about 2 hours north of Venice. It’s part of the Italian Alps, but the side that is called the “Dolomites”. As it turns out 16,000ha of forests and the pasture land in/around Cortina is collectively owned by the original community. They call this system the Regole d’Ampezzo. The lands cannot be sold nor can their intended use be changed. The head of households who are part of the regoliere decide how much wood will be felled (done sustainably), regulate the herds that are allowed to pasture on the lands, as well as promote cultural activities. Plus, Cortina still feels like a community and not just a tourist destination. Our hotel organized a private transfer for us to Venice. As one can imagine traveling with a friendly yet professional local in a Mercedes Vito equipped with water and magazines was very comfortable. The drive took a little under two hours. If you’re on a budget you can also travel via bus to/from Cortina. The bus makes several efficient stops so the whole thing journey to/from Cortina and the Mestre train station on the bus will take about 2 hrs. 20 minutes. It also stops at the Venice Airport. Tickets can be purchased online on the Cortina Express website. One way costs 26 euro and roundtrip is 50 euro. You can find the timetable here. Obviously, you can also rent a car to get there, just make sure they give you winter/all weather tires or chains. This quaint 4-star boutique hotel is near to Cortina’s main street, Corso Italia. It has all the comforts that comes with having 4 stars, but there is something homey about it that makes you feel like you’re staying in a B&B. What should one do in Cortina d’Ampezzo? Cortina is considered one of Italy’s most luxurious ski resort towns. The surrounding mountains provide opportunities for novices to practice on bunny runs but it also has a fair share of black diamond runs for those with an adventurous soul. The main ski area is operated by Tofana Cortina. They have a variety of services within the area like two restaurants (one being super casual, Capanna Ra Valles, and the other slightly more formal, Col Druscie 1778), a daycare, ski lesson etc. An adult day ski pass will cost you between 18 – 30 euro depending on the where you’re going. I think it's worth noting that Cortina actually got its origins as a summer destination. As opposed to some other mountain destinations, the wide open valley ensured that the Cortina got lots of sunlight perfect for hiking or sunbathing, while the high altitude still made it a great place to escape from the hot and humid summers in places like Venice. You can rent or purchase ski and snowboard equipment, GoPros, and apparel. We got a few things here. The quality was super good and the clothing was nice and clean, just how I like it. There are three museums in Cortina: Modern Art Museum “Mario Rimoldi”, Paleontology Museum Rinaldo Zardini, Ethnographic Museum “Regole of Ampezzo”. The main shopping pedestrian shopping street and center of the town is Corso Italia. It’s lined with a number of high-end boutiques selling a variety of brands as well monobrand stores like Moncler and Salvatore Ferregamo. They occasionally sell limited edition pieces made especially for Cortina. Perhaps the most traditional dish of the region is the “casunzei”. This half moon shaped fresh egg pasta is stuffed with a red beetroot filling and then sprinkled with a local poppy seed. This place has all the homey charm one could ever want on a restaurant you could find on a winding road in a little village in a northern Italy. The first thing you see after entering the glass and wooden door filled with stickers referring to the acclaim it has received for noted international guidebooks, it a huge glass-encased fireplace. It takes up most of the room. There’s also like small grill inside, where I feel they make some of the yummy things they serve. This was perhaps the best night in Cortina. Elisabetta (the owner of Hotel Ambra), her friend, Diego and I all went to have dinner at Al Passetto. I have a hard time remembering the last time I laughed so hard. The ladies are pretty good friends with the owner of Al Passetto, Giorgio Ghedina. Giorgio is a former professional bobsledder, and still a man with a certain fascino (charm). He sat down and talked with us for the two hours while we were there having our meal. I had the very traditional casunsei. Diego had a sort of meat skewer made of sausage, roast beef, beef fillet, wurstel (hot dog), and bell pepper all wrapped in bacon. I think the potatoes were cooked in the fat from the skewers, which made it extra yummy. You can get the recipe here. My dish was good but after seeing licking his lips after every bite, I had to ask myself why I thought this was the time to go the “healthy” route. Al Passetto also serves pizza and a few certified gluten-free options, but I didn’t try those. You probably wouldn’t stop, if you were just walking by on Corso Italia. The place looks super small and not terribly interesting. You’ll be pleasantly surprised once inside. It’s super long, well lit (because it would be like a long dark whole otherwise) with a just slightly modern décor. It offers all of the desserts one would expect in a pastry shop in the northern Italian mountains like strudel, sacher torte, ricotta cake, and gelato. I choose it because they offer Dammann frères tea. Embassy is also a good option for lunch with its good quality tramezzini, Venetian finger sandwiches, panini, salads and a few hot dishes. Being an Italian bar/café they have coffee (Illy), wine and cocktails. Go here for lunch a quick informal place to grab a bite of the typical San Daniele prosciutto (http://www.prosciuttosandaniele.it/en/ ) from the bordering Friuli Veneto region. A plate of San Danielle prosciutto aged for 16 months accompanied by a side like burrata will run you about 15 euros. They also have a selection of prosciutto based primi and secondi. I had the ever so creamy bean and barley soup made with San Daniele prosciutto and pork rind for 9.50euro. Note. Just please don’t order the pizza. I got the impression it was frozen dough that they added toppings provided that the whole thing wasn’t just freezer to oven. Because you never really know who you’re going to run into… In this case, that person was Irene, she and Diego did their master’s program together many many years. Irene moved to Cortina several years ago, so she knew the area well. She offered to have us join her and a group of friends at Rifugio Didona. Rifugio translates into 'refuge', shelter, or haven. In general, rifugi were mountain locations where people could traditionally take shelter from the elements and enjoy a hot meal. Nowadays, good rifugio are places in the mountains where people can eat massive quantities of traditional local dishes (you know cold weather makes people hungry), made with local ingredients. Dibona is at about 2000 m in altitude, at the foot of the mount Tofana di Rozes. It is accessible by foot along the mountain trails using trekking shoes in the summer, and snowshoes or a sled in the winter. At night, the owners organize transportation from the parking lot (about 4 km outside of town), to the restaurant, via a snowmobile (aka snow ski!!!). Expect to find dishes like homemade soups, casunsei, polenta with sausage, and of course homemade apple strudel. The first/pasta course costs about 12 euro and the second course around 16 euro. This Michelin star restaurant has a classic alpine décor, lots of wood and fantastic views of the surrounding mountains. Like much of Cortina the ambiance is comfortable, but at the same time it maintains the professional and attentive service standards one would expect of a restaurant that has a Michelin star. I would definitely recommend it, as a not too stuffy introduction to Michelin dining. 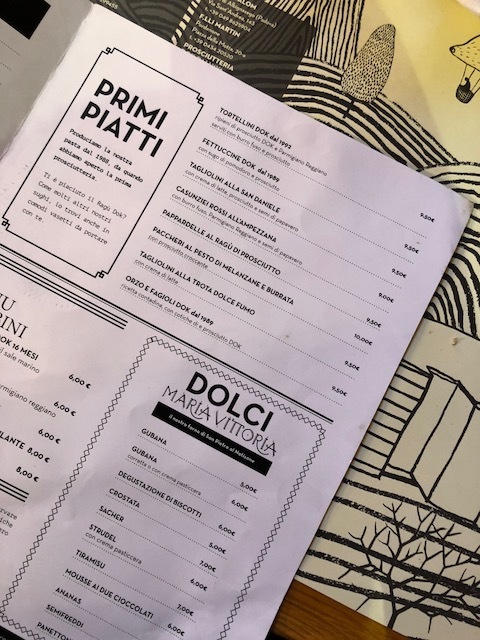 The menu combines the local mountain ingredients and cuisine with fresh seafood found not too far away at the Venice fish markets. A tasting menu excluding wine will cost you about 90-120 euro per person. To see and be seen. I didn’t go there, nor did anyone recommend it to me. But as I passed by around 12 noon, the outside seating area was packed (despite the sub-zero temperature) with distinguishably dressed people in smart Italian clothing and warm fur coats. I got the impression that people went there just before lunch and dinner for the people watching, as the hotel/bar is located right off of the main pedestrian street. That's my guide to how to spend a few memorable days in Cortina d'Ampezzo. Feel free to write me if you have any questions or if you have any questions about Cortina.